TLC Boston Movers is a local moving company serving residential and commercial moving in Boston, Back Bay, South End and Beacon Hill. We are the residential Boston Movers who strive to make your moving experience simplified – regardless of whether you are moving just one street over or across the country. Our professional Boston movers are experienced, reliable and fast. At TLC Moving and Storage our commitment to service is the number one goal. We set high standards of performance, encourage customer feedback, and work to exceed customer expectations. When selecting a mover it is important that the customer be knowledgeable about the company they choose. Our first priority is to make you feel confident in recommending us to your family and friends. Many factors go in to the cost of your move, which is why we are happy to provide free estimates through our Web site or over the phone. All charges are subject to actual time plus travel multiplied by the hourly rate and the cost of materials. Charges must be paid when the move is completed by cash, check or credit card (4% convenience fee applies if card is used for the payment). All the moves are subject to 3 hours minimum charge. 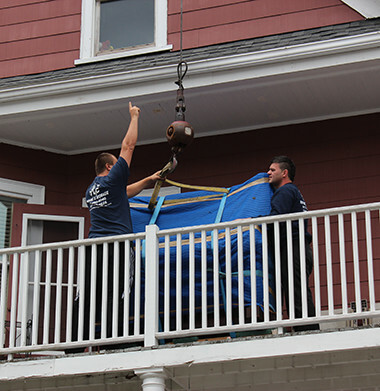 At TLC Moving and Storage we maintain a trait which sets us apart from other moving companies in Boston. Whether we are dealing with house move or office move, we remain versatile and focused. Flexibility is necessary because not every client has identical requirements. TLC Moving and Storage is not just a 7 days/week full service Moving Company in Boston Massachusetts – it’s a customer service company that moves. It’s our goal to exceed your expectations every time you interact with our team. TLC Moving and Storage provides a full line of moving and packing services. We customize our services to fit your moving needs whether you are moving a few large items, an apartment, condominium or a house. Read our professional movers reviews to what our clients say about us. You can fill our Free Moving Estimate Form. Over the years, we have been dedicated to building strong customer relationships and lasting loyalty, which is why 70% of our business is based on customer referrals. We understand how tedious moving can be for families and businesses, and our goal is to create a stress-free, uncomplicated transition. All our moving jobs are done with dedicated, experienced movers who execute and perform your move in the most professional manner. Punctuality and efficiency are the top priorities that allow the TLC moving team to complete your job to your satisfaction.